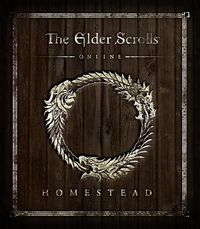 Homestead is a free content update delivered with Update 13 which adds Player Housing and Furniture Crafting to ESO. Houses are available in architectural styles based on each of the ten races, and all initial homes are found within base game areas, meaning purchase of DLC packs is not required. After completing the tutorial quest, which unlocks a room in an inn for free, you are able to purchase unfurnished homes using in-game gold. In order to buy an unfurnished home in a particular zone, you must first complete a task in the local area, similar to many of Skyrim's houses, to build up a good reputation with your future neighbors. Additionally, you can buy unfurnished homes or completely furnished homes from the Crown Store. One of the perks of Homestead is the freedom to design and create whatever you like, so having a Khajiit home with Nibenese decor is entirely possible. Using the Housing Editor, you can freely place furniture and decorations around your home from a selection of over 2,000 items. Furniture and decorations can be crafted using the existing Crafting skills, purchased via gold from vendors throughout Tamriel, or bought in the Crown Store. Special items can be earned as trophies from Veteran challenges, while others can be bought from special vendors after completing specific Achievements. This page was last modified on 28 February 2017, at 18:14.